Why ThermoFin? — Radiant Design & Supply, Inc.
Why ThermoFin? Better By Design! Why do ThermoFin heat transfer extrusions, patented by Radiant Design & Supply, outperform thin folded sheet metal and graphite heat transfer plates? Several important factors make the difference. 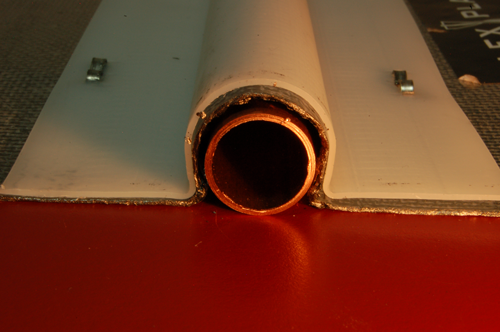 ThermoFin heat transfer plates are extruded of a high conductivity aluminum extrusion alloy. The overall plate thickness is .0625" (1/16"). The patented shape of the snap channel is extruded as part of the plate flanges or fins. The plates measure 4" wide and are available in 48" and 96" lengths and weigh .39 pounds per linear foot making the 4" wide ThermoFin 31% heavier per foot than the typical 6" aluminum sheet metal "Omega" plate. At 8" on center spacing, Thermofins will add .585 lbs to each square foot of floor area and store .126 btu / °F. The inverted "C" shape of the snap channel allows the heat transfer plate installation to be completed first, before the radiant tubing is snapped into the plate. The radiant tubing is separated from the wooden subfloor and held tightly in the snap channel by the heavy aluminum extrusion. Copper tubing shown snapped into ThermoFin - Careful design and precision manufacturing allow even copper tubing to snap into and to press tightly against the rigid extrusion. Note the tubing retains it's naturally round shape after insertion. Copper tubing inserted into ThermoFin is the best heat transfer you can get. it is especially appropriate for radiant cooling applications where overall temperature drop is important. ThermoFin extrusions have been carefully designed to hold and grip the radiant tubing in a very strong snap fit. The extrusion is designed and manufactured to a close tolerance to accept the radiant tubing and force it into its normally round shape after passing through the snap channel. 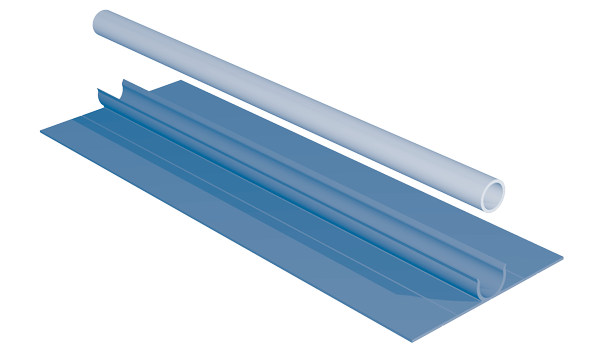 The snap channel design of the rigid aluminum extrusion eliminates air spaces and maximizes the contact area available between the tubing and the heat transfer extrusion. It tightly grips the radiant tubing with sufficient force so as to minimize the thermal resistance at the critical tube/extrusion boundary. PEX tubing shown snapped into ThermoFin. Tight snap grip insures superior heat transfer, prevents differential expansion between the PEX and the extrusion. This controls tubing expansion and eliminates expansion noises. No sealants, glues or heat transfer grease are required to either hold the tube in the extrusion, maximize the heat transfer at the boundary or prevent expansion noises. PEX tubing has a relatively high rate of thermal expansion and is notorious for creating expansion noises in so called plateless "staple up" heating installations. The ThermoFin extrusion holds the tubing so tight, and the heat transfer from the tube into the extrusion is so good, that differential expansion between the tubing and the extrusion is eliminated along with the ticking and creaking noises associated with thermal expansion. The extrusion simply doesn't allow the tubing to expand. This is similar to how PEX tubing behaves when embedded in concrete slabs where the concrete won't allow expansion and the heat transfer is sufficient to prevent the tube from heating. Typical "omega plate" formed of .015" sheet aluminum. How Do Other Products Compare? The typical formed sheet metal heat transfer plates, also known as "Omega plates" are made of aluminum or even steel that measures .015" thick. The typical plate will measure 4" - 6" wide and approximately 24" in length. The better plates will be formed of a high conductivity aluminum alloy and weigh approximately .12 pounds per linear foot. At 8" on center spacing, the Omega plates will add .18 lbs to each square foot of floor area. The "U" or "Omega" shaped plate is installed on top of the radiant tubing and holds the radiant tubing against the subfloor. The installation requires that the tubing and the heat transfer plate must be handled at once. This is a labor intensive process that is made more difficult due to the short length of the sheet metal plates and can make for a sloppy installation. Why don't the sheet metal plates work? - Details make the difference! In these hydronic heat transfer plates, the only opportunity to move heat from the fluid stream in the tubing into the plate is through the shared area between the tubing and the channel formed into the plate. It is well known that conductive heat transfer between solids that are in contact is far more effective than either convection or radiation. Close view of formed sheet metal "omega" plates showing significant air gap as a result of poor fit. It is also well known that the thermal resistance at the boundary decreases non-linearly with increasing pressure. The very tight grip of the extrusion on the tubing, which can increase very slightly on heating and radial expansion, increases the pressure that the tube puts on the plate and acts to decrease thermal resistance at the boundary layer. Air spaces actually make good thermal insulators and even very small air spaces in this area can ruin the heat transfer for the plate. The outer tube wall runs substantially hotter than the center of the sheet metal plates and heat not transferred to the plate is just sent back to the source. Perhaps more importantly, the PEX tubing is free to expand, squirm and move against the underside of the flooring as well as directly against the plate, opening the air gaps and producing expansion noise. To make these plates form-able and cheap, Omega plates are also very thin, (.015"), especially for their width. Because of this, there is inadequate material to conduct heat to the edges without a large temperature drop. As a result, the center of the plate expands at a higher rate than the edges and can create a thermal distortion of the thin plates. This distortion results in the plate pulling away from the underfloor surface, opening air spaces, creating more expansion noises. As a result of the very poor heat transfer, Omega plates are notorious for noise making. It is often recommended that the tubing be glued into the plate with something like silicone sealant to improve heat transfer and help prevent expansion noises. As the Omega holds the tubing to the underside of the floor, gluing the tubing into the upside down U shaped groove is not only expensive but creates a far more difficult installation than may be apparent. The graphite material used in underfloor heating takes the same inverted U shape as the sheet metal Omega plates but because the graphite material is so fragile, it cannot be formed and does not hold a shape. The graphite material has the consistency and tensile strength of a sheet of thin, wet cardboard. As a result, the graphite sheet requires support seen here in a thermoformed polyethylene stapled to the graphite. Thin graphite cannot be formed like sheet metal and requires the polyethylene support. Photo shows significant air gap against a 5/8" od copper tube. The tolerances are so poor that it is not possible to staple this up against the floor and firmly hold the tubing. The graphite product suffers from the same basic deficiencies as the sheet metal Omega plates due to poor heat transfer at the tube / graphite interface and the low conductivity of the graphite sheet. Significant air gaps between the tubing and the graphite sheet is unavoidable. The tubing is completely free to expand, squirm, and create expansion noises. The fragile, floppy graphite sheet must be heavily stapled to the substrate to achieve any real contact or to hold the tube in place. The poor tolerances in the polyethylene sheath prevent the installed product from any meaningful contact between the tube and the graphite sheet. Though high thermal resistance at the tube / graphite interface makes the conductivity of the graphite material unimportant, it appears that the grade of graphite material used in the graphite product on the market doesn't have higher conductivity than the aluminum used in classic .015" aluminum Omega plate. The Brand X extruded heat transfer plate is a poor copy of Radiant Design & Supply's original ThermoFin design. The manufacturer of this extrusion formally claim that the "faceted" interior surface of the tubing channel and the significant built in air gaps actually serve to increase heat transfer as compared with the original ThermoFin tight snap channel design. Obviously, with the tubing not contacting the aluminum, that is not true. Caveat Emptor! What about Brand X extruded heat transfer plates? The Brand X extruded heat transfer plate on the market is a poor copy of the original ThermoFin designed by Radiant Design & Supply, formerly Radiant Engineering. The Brand X manufacturer deliberately altered the patented design of the ThermoFin to incorporate large air spaces into the tube channel. As a result, the product suffers from poor heat transfer and even tube disengagement. Brand X is also thinner, (.050") and narrower, (3-3/4") than the original ThermoFin. This shape shares the inverted C shape of our ThermoFin C product which allows for easier tube installation under the floor compared with U or Omega shapes. The Brand X manufacturer does not make this extrusion in 96" lengths. Brand X loses performance as a result of its poor design. However, its overall weight and lateral heat transfer characteristics are more comparable to the Radiant Design & Supply ThinFin product. 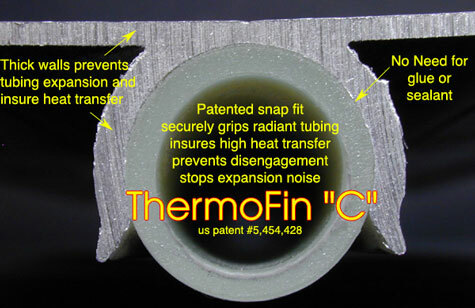 The ThinFin takes lessons learned from the original ThermoFin and incorporates the original ThermoFin snap channel design in an .050" thick x 3-1/2" wide high performance, economy extrusion. The ThinFin is especially appropriate for tight tube spacing in high performance applications as well as radiant applications with wider tube spacing in less demanding applications. Go to the ThermoFin page for more links and specifications regarding ThermoFin C, ThinFin C, and ThermoFin U heat transfer plates. To buy ThermoFin, contact us using the form on our Contact page.